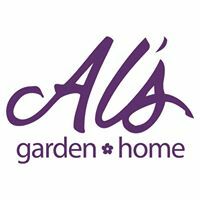 Grown by Al’s perennials, annuals, trees and shrubs; garden decor and accessories; control products; patio furniture; gifts. A family business, offering you the best for your home and garden since 1982. Located in the heart of the Willamette Valley, our family business began in the early 1980s as a father-son venture. Over the years, we have benefitted from the skills and experiences of four generations, all of which have contributed to our continued growth. We started with the slogan “service is our best product” and it is still the mantra we live by. Our retail store and showroom, located in a warehouse in Hubbard, Oregon, provides a unique setting for the products we manufacture and represent, including an impressive Farmhouse Style presentation. Our Kelly Rae Roberts collection is one of the largest in the United States. Our showroom offers unique p 100 manufacturing companies representing home interior, yard, garden and patio décor.